Raison D’Être is the main outfit of Sweden’s Peter Andersson, whom you might know as well from, for example, Necrophorus, Grismannen, Stratvm Terror, Bocksholm (with his name-mate Peter ‘Lina Baby Doll’ Andersson of e.g. Deutsch Nepal and Frozen Faces), Atomine Elektrine and many others. This project is one of the most influential ones within the Swedish, and worldwide, Industrial scene, with tens of highly acclaimed releases throughout the years. I will, by the way, publish a review for Alchymeia, the newest full length, very soon. Troum are a duo (Martin and Stefan) from Germany, and can be considered a continuation of (sadly defunct) Maeror Tri. Their goal was, and still is, to guide their audience into ‘a hypnotizing dream-state of mind, a pre-verbal and primal consciousness sphere’. If you want an example, check out the review for the excellent Acouasme album, published on March 6th 2016. Years, many years ago, both acts decided to join forces to create something unique, together, a collaboration which would, eventually, each time, being guided, supported, accompanied, finished, by one of both. It started in 2015 (at least for the audience, since the musicians involved were working together on it for a couple of years), with the release of De Aeris In Sublunaria Influxu, released via different sources, like Peter’s Yantra Atmospheres label, Essence Music, and Drone Records. Everything was created by Peter, Stefan Knappe and Martin Gitschel, and processed, manipulated and structured by Peter at the end of 2014. The result was (and still is, of course) a finely-balanced mixture of Atmospheric Ambient and melodious Drone Music, channelizing elements from both projects, and creating something quite renewing too, at the same time. And now it’s time to enjoy the second chapter of this diptych, once again based on basic compositions created by both Troum and Raison d’Être. For Xibipiio – In And Out Of Experience, Troum ‘deranged and reframed, morphed and transformed’ the originally written material (2013-2017), being responsible for the final mix (with Peter Andersson still doing the mastering duties). The result is ‘an excursion into nine different micro-worlds of perception and consciousness’, based on a concept by a tribe that lives in the vast Amazonian woods (the so-called Piraha-tribe). The physical album gets released via Transgredient Records, which is a sub-division, if you want to, of Drone Records, on which the first part got released. It comes in a six-panel digipack, and the result lasts for something over an hour. The digital format has been made available via Peter’s Yantra Atmospheres label. As said, it is like mingling sound sources from both acts. Here Raison d’Être’s materials are used and re-processed by Stefan and Martin, with re-arranged and additionally sub-recorded stuff injected to the original ideas. Music that reaches for the eternal, but it only exists in the very moment… Hypnotic waves of darkened drone and spiritual ambience come together unto ethereal soundscapes of dark, yet deeply esoteric and even ritualistic majesty, like a multi-coloured palette focusing on grey hints only. Many sonic sources, including synths and percussions, field recordings, and even traditional ethnic instruments, are used to paint this aural landscape of mysticism and exploration. Sometimes, you get accompanied on your journey through untrodden woods by energetic empowerment (The Machine Starts To Sing is an interesting example, or what about the apocalyptic and disturbing obscurity in Ijä-Kyl), then again the introspective angle of man’s awareness gets teased by integer, often quite ominous soundscapes and drones, based on eerie string sessions, scarifying keyboard lines and more asphyxiating ambiance (Eigi Einhamr, Dreiklang Aus Äther, etc. ), or you’ll be lost, confused, uncomfortable, when the militaristic industrialisation takes over the tantric atmosphere (cf. Expulsion Of The False Self or Hang’-E-Lah, for example). Yet every time, it’s the oppressing and overwhelming impression of dreamlike and trancelike elegance that overpowers the listener’s ability to explore, to delve deeper into this aural art experience (at least, it goes for my personal ‘ability’). I admit, the former phrase says everything, and none at the same time, but listen carefully and you’ll understand... Or said otherwise: the hypnotic drones of dreams by dreamers who are awake combined by dark-ambient industrial landscapes of beauty and sorrow are canalised into a perfect / perfected mixture of both projects involved, continuously thrilling, mesmerizing, bewitching and brain-teasing. 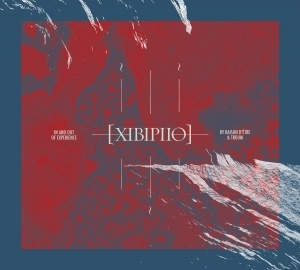 Xibipiio – In And Out Of Experience brings forth the superior craftsmanship of the three musicians involved. The album combines both project’s most elegant aspects, turned into a magnificent, organic symbiosis that still comes with many different aspects. Despite the long duration (+1h), you are permanently aroused and challenged as listener, and there is no chance of boredom. Actually, well, no, I can go on, but I guess you might get the message… Recommended indeed!